Good Lord Almighty! Hell for me would be forever reading court documents in constitutionality cases in North Carolina. I've got the blind staggers after spending much of the day on the text of Judge Ervin's decision in Roy A. Cooper v. Philip E. Berger and Timothy K. Moore, a landmark case, but gawd! the language, the terminology, the "magic words"! A tar-pit, if you'll forgive the all-too-obvious reference. Nevertheless, I've often been engrossed in it, and sometimes nonplussed. Phil Berger and Tim Moore. 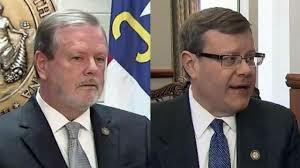 It appears that "on its face,"
To boil it down: A three-judge panel appointed by Chief Justice of the NC Supreme Court Mark Martin especially to hear the governor's suit against the legislature last October -- in which the governor claimed that Berger/Moore violated the separation of powers provision of the state constitution in restructuring the boards of election and ethics and taking away the governor's ability to appoint the members of those boards as he pleases -- those three judges entered an order on Halloween Night, 2017, determining that it "lacked jurisdiction to reach the merits of the Governor's claims" ... leaving the General Assembly's power-grab in place and punting the issue to a higher court. The Supreme Court caught the ball: "We'll take it from here." I've learned a lot today about "the political question doctrine" and "justiciability," which was the foundation on which the 3-judge panel refused to act. LawBrain defines a "political question" as "an issue that the courts refuse to decide because it properly belongs to the decision-making authority of elected officials" and is therefore not a matter appropriate for court review -- "non-justiciable." The NC Supreme Court did not agree with that reasoning and asserted its constitutional right to review the General Assembly's restructuring of the Board of Elections and Ethics and its cutting the governor out of the ability to appoint and control that combined board. It is not a political question, Ervin's decision asserts, because what the General Assembly did is also a fundamental violation of the separation of powers between the executive and the legislative branches of government, and on the face of it is an unconstitutional usurpation of power. That's another word I've learned: facially. On its face. So obvious it hurts. Much of the Cooper v. Berger and Moore decision focuses on the separation of powers and on the Supreme Court's ability -- nay, responsibility -- to test and check the General Assembly's power-grabbing ambitions -- the power of "judicial review." The General Assembly cannot ... structure an executive branch commission in such a manner that the Governor is unable, within a reasonable period of time, to “take care that the laws be faithfully executed” because he or she is required to appoint half of the commission members from a list of nominees consisting of individuals who are, in all likelihood, not supportive of, if not openly opposed to, his or her policy preferences while having limited supervisory control over the agency and circumscribed removal authority over commission members. I can read that, and understand it very clearly, and so can Berger and Moore. When is Bill Aceto going to, at long last, finally sit down and shut the hell up?